This story is about vines trained against walls, and Chasselas table grape. One of things people rarely know is that the Paris region was the #1 wine region in France before the Phylloxera era. Another little-known story is the vines-against-walls that were grown intensively in Thomery since the 18th century. This village, which lies along the winding Seine river, 75 km east of Paris near the royal city of Fontainebleau, had found a way to supply Paris with high-quality Chasselas grapes in the middle of winter, and this, for more than 200 years.... See this aerial view on the right and try to visualize how the tightly-packed alignments of walls looked like without the houses, most of them having been built recently. By 1835 already, Loudon's "Encyclopedia of Gardening" referred to Thomery's Chasselas and to its peculiar training system. Read this page [word] from his book (thomery is evoked in the second half of the text). We know that Thomery's wine was a favorite of the king François 1st in the first half of the 16th century. That's why his winery ("les Pressoirs du Roy") was built here. 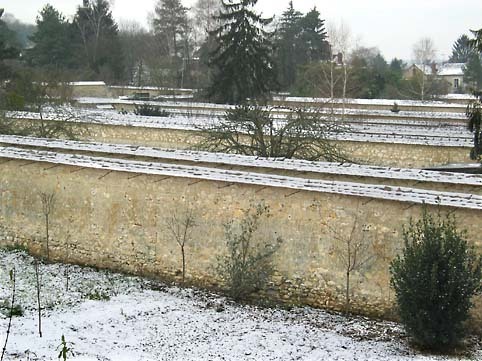 Then, later, in 1730, after table-grape vines from the southern city of Cahors were planted and trained against a 1200 meter-long wall on the Fontainebleau Chateau's grounds, someone named Francois Charmeux, after noticing the excellent ripening effect of this walled training system, began to build parallel walls in nearby Thomery and to plant vines against them. The idea was to grow high quality Chasselas grapes and sell them in Paris, a night boat-ride from there, then. 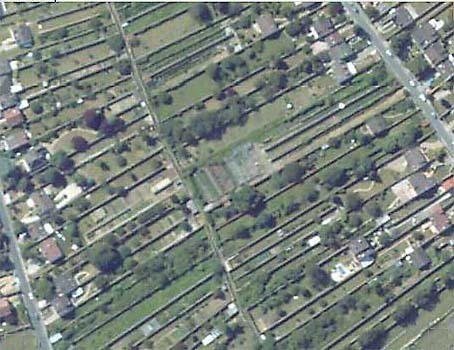 IGN aerial picture of Thomery (detail). Walls are typically 9 meters from each other. Most of the houses here were built recentlyIt worked so well that 350 km of walls were built in this small village, on the slope going down to the Seine. These parallel walls were erected 8 to 10 meters from each other, oriented so as to make the best profit of the exposition, vines being planted along one side only. The high volume of grapes made people look for ways to preserve the grapes and sell them later than at harvest time (the harvest market was saturated and prices dropped). 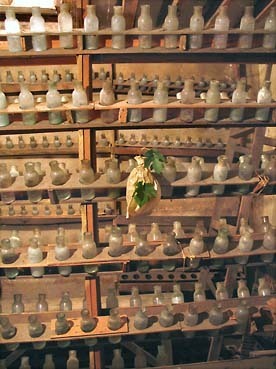 Soon Rose Charmeux invented an odd way to keep the grapes till Christmas and even beyond : individual clusters would be placed at the top of as many small bottles of water in dark fruit-rooms to reach Christmas unscathed. Some sulphur would be occasionally burnt in the rooms to kill-off infections and paper bags would be disposed on the grapes to further protect them. At a time when there was no air-conditioning system and no possibility to fly cargo from the southern hemisphere, this allowed to sell the renowned Chasselas of Thomery continuously and on-demand till Christmas. This was revolutionary by these times' standards... 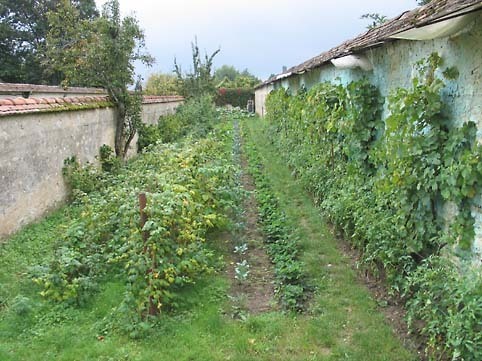 Typical Thomery wall (vines on the right), with vegetables or fruit trees growing inbetween the wallsThe high density of walls allowed an even better ripening, with the walls keeping and reverbating the heat during the night. As you see on the picture, the walls were roofed, the vine-side of the roof being wider to protect the grapes against extreme heat and rain. The grapes were protected by individual paper bags on the vine too, to prevent microbial infection, or to ward off insects like this hornet (pictured in Thomery too) on the right. Light filtering panels would also widen the roof for a better protection. You can see some of them (in shambles) on the right of the picture. 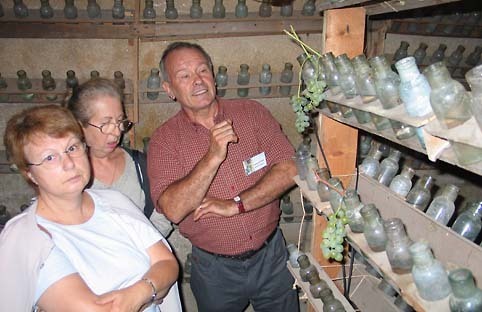 Visitors in one of the last equipped fruit-rooms of Thomery In this very interesting interview by Thierry Lerche (in french) [Word file], the chief gardener at Fontainebleau, in which he explains a lot about his work, we learn many important details of this Thomery story : The original vines were brought from Cahors. 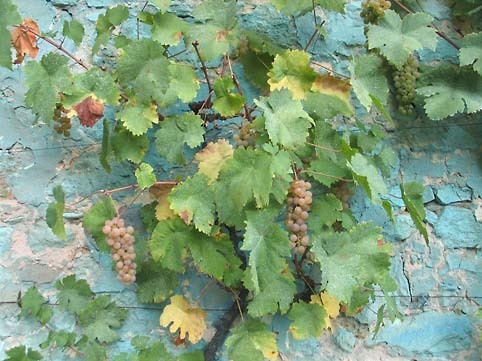 This grape variety, known now as the "Chasselas Doré de Fontainebleau" is one of the most difficult variety to grow, and it is very sensitive to various illnesses. The climate is indeed very different in Cahors and Thomery, so the idea was to get higher temperatures with a training system against walls. In addition, the clusters would be protected by an individual bag even when still on the vine, to prevent microbial infection, fungus, or damage by insects. After the harvest in september or october, the grapes would then be kept fresh for months in dark fruit-rooms, which were often cool cellars (8-10°C), each cluster feeding on its individual bottle of water, with a little bit of charcoal in it to prevent the water to get spoiled (and occasional sulphur-burning). At the peak of Thomery's golden age, 250 families made a living from the grape growing activity, and even more, as bottle-makers, wall-builders and other specialists came and built businesses here. If Christmas was the target season for selling the grapes, the fruit-room system allowed to preserve the grapes till march or april. 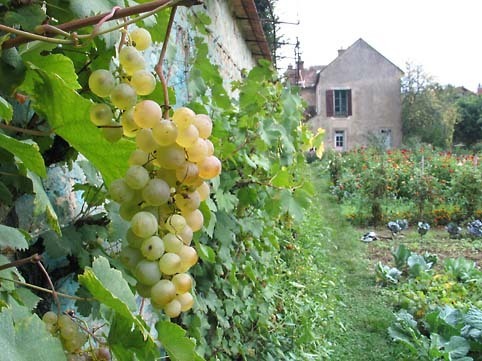 An average family in Thomery could store 500 or 600 kg of Chasselas that they would release on the market in winter, when demand would push the prices up. More than 800 metric tons of grapes were transported to Paris yearly by barges. It was only after the invention of refrigeration machines and when air-cargo companies began to flood european markets with fruits from the southern hemisphere, that Thomery's business collapsed. This unrestored wall still shows the colour of copper sprayThe business in Thomery began to slump before World War II, but even more after the war, before stalling altogether somewhere near 1970, when air freight costs for imports from the southern hemisphere dropped substantially, allowing large-scale influx of fruits in winter. According to someone I met in Thomery, and who studied the history of the place, you still could find Thomery's "Chasselas Doré de Fontainebleau" at Fauchon, the ultra-deluxe specialty-foods gourmet store in Paris, well into the 1980's. 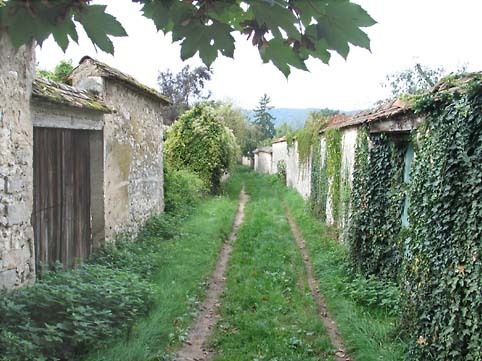 A path perpendicular to the walls alignments The narrow strips of land between the walls has been converted in private gardens for the newly-built homes, but many still have the Chasselas vines on one side of the wall, and the traditional orchard or vegetable garden in the middle, because the walls have such a positive ripening effect on everything growing in between. Brilliant post. You provide an insight into the French wine-making experience that is much needed. Here in America, the US, we have no real idea of your country's efforts, your sublime wine-making history. You are making a difference. I will tell my friends of this blog. Great work. what does the copper paint on the walls serve to do? Thanks for the comment. I think that the copper stains on the picture come from years of sprayings on the grapes. I am from Thomery (but am now living in Washington DC) and must say that your recount of Thomery's history is very accurate and very well documented. I encourage everybody to visit our village. A few families are still growing some vines, usually for their own consumption but I know that they are also trying to create a museum. My parents and others donated many old pictures, tools and bottles. Fauchon, a fancy parisian store (like Dean and Deluca here) was selling Thomery Chasselas grapes up until 30 years ago. I currently live in Thomery and have the Chasselas grape growing in my garden. Thank you for this wonderful website that I can forward to my non-French speaking friends. I will be moving to Thomery very soon. I am very interested to know more about this place. This was a great introduction. Thanks for the post. Making a documentary film on the cultivation of greenhouse grapes in Belgium, I was wondering were I still could find some fruit-rooms ... and I found the information on your website.